The Venerable' Bede (c.672-735) finished writing his 'Ecclesiastical History of the English People' in 731; it is an historical account of Christianity in England down to his own lifetime. It has been called 'the foundation of all our knowledge of British history and a masterpiece eulogised by the scholars of every age'. 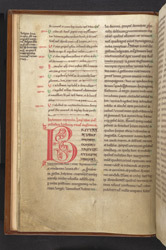 This manuscript was owned by the Cistercian monastery of Newminster, Morpeth (about 15 miles north of Newcastle), and the monochrome blue, red, or green 'arabesque' initials are typical of manuscripts made in northern English Cistercian foundations. This initial 'B' marks the end of the tales of chapters, and the start of Book I of the main text.